Milestone's highly anticipated MotoGP '13 races off the line this week in what promises to be the most authentic video game recreation of the sport in years. We managed to get hold of the game early to put it through its paces in our extensive and exclusive hands-on gameplay videos that take you along for a white knuckle ride as we embark on a long-haul journey through the comprehensive career. Indeed, our YouTube channel has been positively flooded with MotoGP '13 content over the past week, so we thought we would gather them altogether into one handy round-up, giving first-time players an idea of what to expect when they boot up MotoGP '13 for the first time. For novice players who are inexperienced with biking games, we recommend opting for the Standard setting which, in essence, is like learning to ride a bike with stablisers, with a more accessable handling model that negates certain elements found in the higher difficulty settings that mean you don't have to worry about falling off on every corner. You now have to fully account for the rider physics, coordinate the indpendent rear and front brakes and delicately apply the power and brakes to balace the bike. It's not easy, but then neither is riding a MotoGP bike in real life, and Pro aims to mercilessly simulate the sensation as closely as possible. Without practice, it's safe to say your digital rider will have broken every conceiveable bone in his digital body by the time you finish a race on Pro. In our final run, Alan takes us for a ride along the Catalunya circuit located in sunny Spain in the remaining bike class class: Moto2. The 600cc Moto2 bikes act as the intermediate class that remove the stabilisers from the Moto3 bikes and are noticeably more difficult to handle as a result to prepare you for the challenging full fat MotoGP class. For fans of the sport, we're confident in saying that MotoGP '13 is by far and away the most accurate video game representation we could have asked for, and the smooth learning curve provided by the physics settings also means that players who aren't avid fans MotoGP fans but still enjoy pick up and play bike games can enjoy the ride without fearing of falling off at every corner . 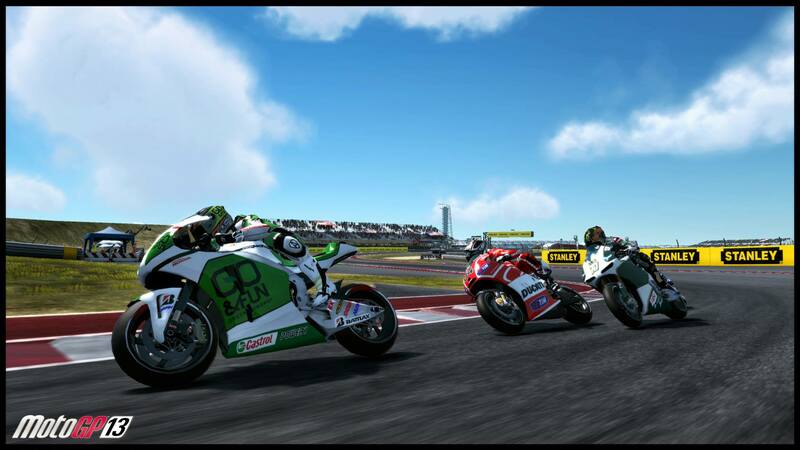 MotoGP '13 launches off the line June 21st. You can preorder it directly from publisher PQube's website.